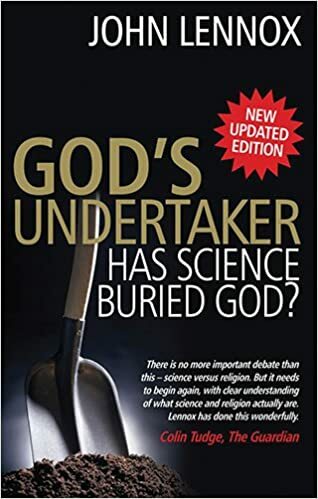 Renowned Christian apologist and Oxford University Professor of Mathematics, John Lennox, explores these questions and the ongoing debate between science and religion in God’s Undertaker – Has Science Buried God? God, as Christians understand Him, is far more than a “God of the gaps” (an explanation supplied when natural explanations are not readily available). He is the source of all explanations. Christianity is not a “blind” faith. Rather, it is evidence-based. Many famous scientists were inspired by their belief in a Creator . Many respected scientists are believers, even today. Lennox makes a compelling case that the fine-tuned universe we inhabit; the complexity of the biosphere; and the emergence of life from non-life (and mind from mindlessness) are not fully explained by unguided natural processes. John Lennox cautions from the outset that scientists when speaking about God are not speaking about science at all; that science and the philosophy of naturalism are not one and the same. Carl Sagan’s well-known statement, “The cosmos is all there is, or was, or ever shall be” illustrates this. It is actually a statement of personal belief, not science. Lennox goes on to demonstrate that scientists do not necessarily have open minds, insofar as philosophy and theology. Nor, of course, does expertise in science make them expert in areas other than science. Geneticist, Gregor Mendel’s ideas were, for example, rejected by Marxists as contrary to their worldview. Lennox explores in depth the logical, mathematical, and scientific limitations of the theory of evolution. He acknowledges the threat the theory of evolution poses to morality, but challenges any assertion that evolution mandates atheism . Below are some of his arguments. John Lennox characterizes a belief that the universe is rationally intelligible as foundational to science. He traces this concept back to the Hebrews, who maintained that the universe was created and governed by a single God . The later Greeks credited a variety of gods and goddesses. Lennox willingly admits that the forces of nature had to be undeified to allow for scientific study. He maintains, however, that removal of the gods was not the same as removal of God. Logos (the Word of God, the second person of the Trinity, incarnate as Jesus Christ) was outside the world; the gods were inside – and products of – the world. The rational intelligibility of the universe and the scientific evidence for a beginning (often described as the “Big Bang”) are consistent with the biblical story of creation, and the concept of a Creator . Intelligent Design is, therefore, a scientifically testable hypothesis . Scientists increasingly recognize that the universe appears to have been fine-tuned to permit life. John Lennox discusses the evidence for this from cosmology, physics, and chemistry. By itself, such evidence does not prove or disprove the existence of God. It does, however, call for an explanation…an explanation the theory of evolution is not equipped to provide. Galileo Galilei, Johannes Kepler, Blaise Pascal, Robert Boyle, Isaac Newton, Gregor Mendel, and Louis Pasteur are just some of the great Christian scientists. See, also, “Christians and Science” at https://alawyersprayers.com/2012/11/08/christians-and-science/. Unfortunately, many popular books and science textbooks give the opposite impression. Thomas Aquinas identified God as the First Cause. Aquinas viewed secondary causes as operating within the world. That these secondary causes can be described as laws does not imply the non-existence of a Creator. The evidence supporting the “Big Bang” includes background microwave radiation, and expansion of the universe. To be fair, not all scientists agree with the “Big Bang” theory formulated by Catholic priest and astronomer, Georges Lemaitre. Christians, of course, believe the Bible provides more than a hypothesis. Some theologians are continually trying to bend or reinterpret Scripture to accommodate science. Consider that science represents man’s imperfect findings about the cosmos continuously being refined (changed) throughout the research stream of many generations of scientists. Conversely, Judeo-Christian Scripture is the perfect revelation of God as revealed by Him. Science should be viewed through the perfect lens of Scripture. God’s perfect revelation should NOT be viewed through the imperfect lens of human scientists. When the priorities and relationships are clarified, then the imagined conflict between science and the Bible evaporates like a puddle on a hot desert day. God’s truth will always be more profound than man’s. I believe that Scripture is His revealed word. I did not always, however, understand this. God wrote His Name across the sky so that all might see it…even those unfamiliar with Scripture. His handprint is on all creation. Wouldn’t you agree, Dr. Stebbins? I’m sure you will agree Anna that God makes it very clear both in Creation and in Scripture His Reality. I have also shared on Freedomborn why they both leave no doubt that we were Created and did not evolve . It would be great if we all admitted that there are limitations to all of our beliefs, whether religious or scientific. Neither explains everything. Very perceptive, Kathy. That is exactly where faith comes in. We are — deliberately, I think — balanced on a knife’s and called upon to make the decision of our lives. For those of us who opt to believe, the evidence for God’s existence is more than sufficient. For those who opt not to believe, no amount of evidence will suffice. But faith and rationality are not opposed. It is, in my own view, unreasonable for Christians to demand that non-believers abandon the very reason with which God endowed them. Such abandonment is distinct from the recognition of our own limitations, and acknowledgment of a power greater than ourselves in the Person of God Almighty. I meant to share with you before Anna why I have no doubt that God is a reality now but this was not always True. I had been an Atheist at least in my head for almost 30 years although Jesus had been my friend when I was a young Child and I Loved Him and He comforted my greatly as He does now but because of being deceived that I came from an Ape as a young Teenager which I now know is impossible but I believed my Atheist Mother who had Adopted me and my Teacher and so after having had such an abusive Childhood I had no good foundation to live my life by and was very insecure and so I continued in confusion hurting others and myself, as the link below confirms. When I once again realized as an Adult that Jesus was a Reality because of the overwhelming evidence, I had His Peace again that I had lost because of the foolishness of others in their unbelief, of course Jesus went after His lost sheep, yes He knew me as His own, God knows all things from the beginning to the end. Thank you for sharing your story, Anne. You poignantly illustrate how difficult the walk of faith can be for abuse victims. My own journey was not so far different. You can find my testimony on A Voice Reclaimed at “The Book of Job” https://avoicereclaimed.com/2014/12/21/the-book-of-job/. Those who have had an easier road may never understand how battered a heart can be. But God is faithful. He found us though we were lost. He rescued and lifted us up.